Hornaday inside the Bronx Zoo Administration Building, 1910. Actually, Hornaday had a large shelf of “personal books”: in addition to the nearly two dozen published books he wrote and the pamphlets he bound together, Hornaday also compiled various scrapbooks, including a series of fourteen scrapbooks chronicling the several wildlife protection campaigns he spearheaded. 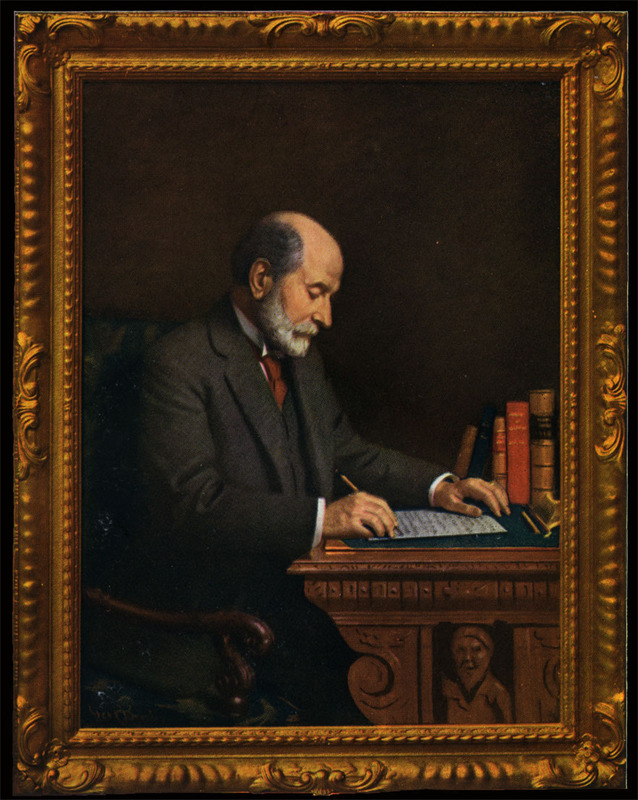 For nearly three decades, during much of which he also served as first Director of the Bronx Zoo, Hornaday led fundraising and lobbying efforts to protect North American wildlife. He wrote countless press releases and letters to editors, and his work received national press attention. 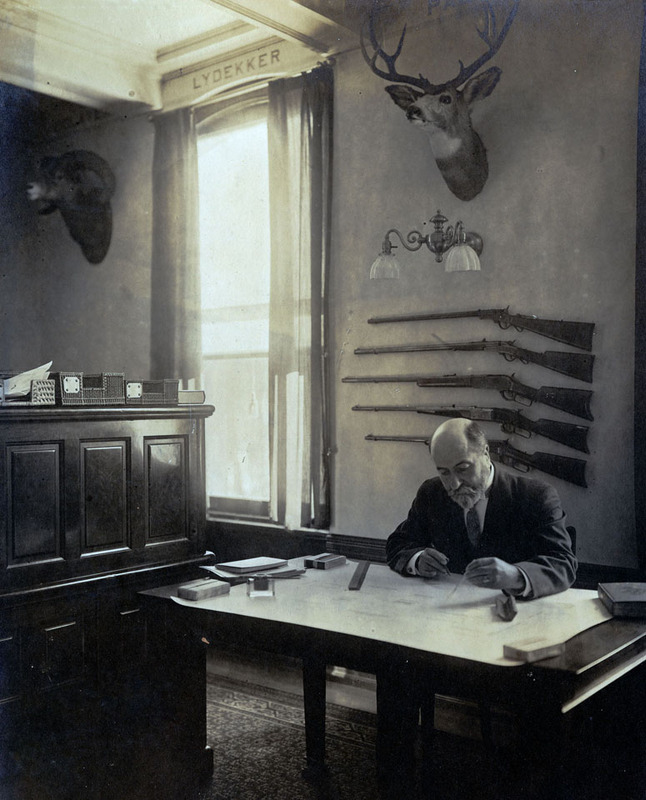 He went on national speaking tours, corresponded with state and national leaders (including three presidents), and cultivated support from wealthy philanthropists for his Permanent Wild Life Protection Fund, which he used to finance his campaigns. Seeking to engage both the public and lawmakers, he took on various causes: the formation of a protected game preserve in British Columbia, an (unsuccessful) attempt to create wildlife preserves in federal forests in the American West, the development of a herd for the Montana National Bison Range, and, most prominently, legislation to regulate the overhunting of wildlife, from the fur seals of the Pribilof Islands and the sage grouse of the Iowa plains to the continent's migratory birds. In his scrapbooks, Hornaday gathered up the fragments—the thousands of newspaper clippings, magazine articles, pamphlets, correspondence, and ephemera—concerning these campaigns. In doing so, he was consciously constructing a history of early efforts to protect wildlife, a fact underscored by his own title for the collection: The William T. Hornaday Scrapbook Collection on the History of the Wild Life Protection and Extermination. As he explained it, the scrapbooks were “carefully kept down to the limits of useful history, intended to reveal the two sides to our subject, protection and extermination.” They were most definitely, however, not intended to reveal any side to the history of these events other than Hornaday’s own. Through the books’ contents and his frequent annotations, Hornaday casts himself as the hero battling a series of enemies in the fight to save wildlife. Portrait of Hornaday, circa 1923. In 1936, a little over six months before his death, Hornaday left his scrapbooks, photo albums, publications, correspondence, and other ephemera to the New York Zoological Society (known today as the Wildlife Conservation Society). According to a September 1936 letter he wrote to his successor at the Bronx Zoo, W. Reid Blair, Hornaday believed that the collection would be useful to historians “who, twenty years from now will be scratching around to find the answer to the question, ‘Why did the American people permit all their game to be exterminated?’” In fact, the Wildlife Conservation Society and others have continued and expanded Hornaday’s fight, striving to protect wildlife and wild places across the world. But Hornaday’s desire to safeguard his collection also speaks to his belief in the importance of preserving the history of this work. He saw himself as a conservationist not only of wildlife but also of history, a role he acknowledged in the preface to his handmade book of pamphlets. As he wrote in explaining his desire to create the book, “The business of a true conservationist is to save something from the wrecks that strew the sands of Time. And here, like charity, conservation begins at home.” Today, the Wildlife Conservation Society Archives continues this work of “conservation at home” by preserving Hornaday’s collections and dozens of others that document WCS’s history. Please consult the WCS Archives website to learn more about these holdings.